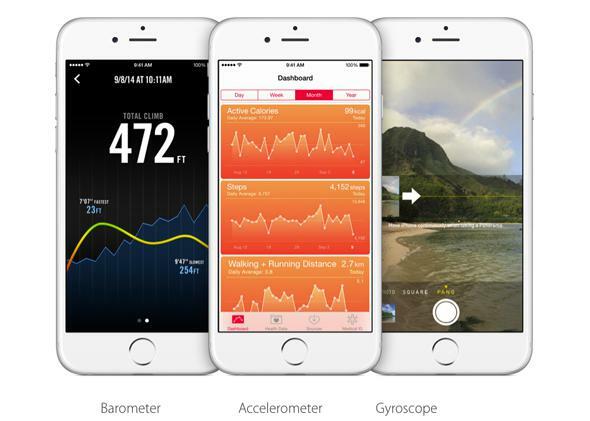 iPhone 6 and 6 Plus both have barometers that could help crowdsource hyperlocal weather. The iPhone 6 is chock full of sensors. The iPhone 6 and 6 Plus have a lot of nifty added features like near field communication for secure transactions and screens with serious pixel density. But one of the most noteworthy pieces of new hardware that Apple stuffed into the handset is a barometer (which measures atmospheric pressure). But as lots of people have been quick to point out, barometers have been in Android phones like Samsung’s Galaxy line for years. Indeed, as Jesse Ferrell of AccuWeather.com points out, “I got a digital watch with a barometer in it for my 10th birthday in 1985.” So does it matter that Apple is finally giving the little sensor some play? Sure! Apple plays a big role in bringing technologies to the mainstream, whether or not they’re novel. Now that iPhones have barometers, other smartphone makers that weren’t concerned about adding them before may think twice now. In fact, the weather crowdsourcing idea is already in motion. Companies like Cumulonimbus, which makes the localized forecast app PressureNet, are part of a growing group of startups founded around the concept. Even Slate’s own weather blogger Eric Holthaus worked on a weather crowdsourcing iOS app before the iPhone had a built-in barometer. Local pressure data could help create more reliable forecasts so we can all make more detailed decisions around weather affecting us, from little showers to tornadoes. It could also broaden meteorologists’ access to weather data in remote regions all over the world. All of this and the iPhone’s barometer will probably be primarily used as a way of measuring users’ elevation for fitness apps. Typical.